Some people have dreams and visions that have been put aside or on the shelf. 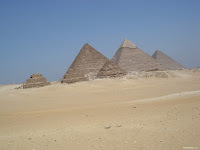 They may have dreamed of seeing the pyramids in Egypt, starting a new business or career, going back to school, or maybe learning to play a musical instrument. But the great distractions of life come into play. Paying rent and bills, mountains of debt accruing, going through a divorce, having kids to care for, losing a loved one, economic hardships and numerous other things tug for attention and pull many away from their dream. The dream and the aspirations that go with it are lost like a forgotten treasure buried in a field. Others don't forget the dream but give up on the notion that it is attainable. The dream itself is good enough for them. To actually go after their dream is frightening because it might mean dissappointment. Yet there are those who do not give up on their dreams despite the obstacles. They know that fear must not deter forward movement toward the dream; and that risk is a part of realizing the goal. They understand that, win or lose, by simply giving their best, the universe will reward their effort. These dreamers are aware that living with no regrets is the secret to contentment and that only few ever come to grasp what this is. They say to themselves, "A life with no regrets is a life well lived." This is their mantra.